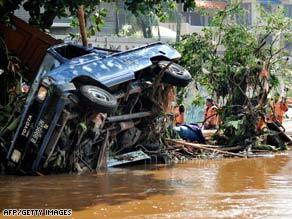 JAKARTA, Indonesia (CNN) -- Heavy rains smashed through a dam near Indonesia's capital Friday, unleashing a torrent of water that plowed into hundreds of homes and killed at least 52 people in what some survivors described as a suburban "tsunami." Members of a search and rescue team look for bodies around upended trees and vehicles near Jakarta Friday. Sleeping residents were taken by surprise by the powerful flash flood as it crashed through Jakarta's crowded Cirendeu suburb, in the early hours of the morning. Rescue crews suspended their search for survivors overnight Friday evening, the National Disaster Coordination Agency said. The agency put the death toll at 52 with 17 missing. It said 33 people were injured and 1,490 left homeless. The Indonesian Health Ministry put the death toll higher at 58 people. After the deluge, drenched, injured and shivering survivors took refuge on the rooftops of their homes as rescuers in rubber boats struggled to reach them. Social affairs spokesman official Mardjito, who like many Indonesians goes by one name, said relief efforts were being hampered by debris from the dam. "We're still trying to get into the houses, but the problem is, mud is getting in our way," he said. Indonesian President Susilo Bambang Yudhoyono, currently on the campaign trail ahead of elections later this year, said he had ordered senior ministers to visit the scene of the disaster. The rain obliterated a 255-meter-long section of the dam at around 4 am local time, releasing a wall of water from the 20-hectare lake that some survivors said reminded them of the tsunami that hit Indonesia in 2004. "They said they had heard loud rumbling sounds like during a powerful earthquake. They later found out that the sounds came from the water rushing out from the dam's lake," Antara said. Survivors told stories of dead relatives and harrowing brushes with death as they struggled to escape rising waters. Dewi Masitoh, a 40-year-old housewife, told the AFP news agency that she escaped with her husband and two daughters after they saw rising water reach the door of their stilt house. "We were on the second floor but my daughter went back downstairs when the window broke and water gushed in. My husband jumped in and pulled her out of the water by her neck. "I punched a hole through the roof and we all climbed up through," she said, showing cuts and scratches on her arms." Floods from heavy rains are an annual occurrence around Jakarta, a low lying city on the northern coast of Java island, where poor infrastructure often results in polluted canals and rivers spilling their banks and spilling into thousands of homes. In 2007, 38 people were killed and 430,000 forced from their homes when storm waters three meters deep in some places swamped 75 percent of the capital, which is home to about 9 million people.